Is dark matter the "operating system" of the Universe? Tom Broadhurst, an Ikerbasque researcher at the UPV/EHU's Department of Theoretical Physics, thinks it is. He has participated alongside scientists of the National Taiwan University in a piece of research that explores cold dark matter in depth and proposes new answers about the formation of galaxies and the structure of the Universe. This theory can be used to suggest that all the galaxies in this context should have at their center large stationary waves of dark matter called solitons, which would explain the puzzling cores observed in common dwarf galaxies. 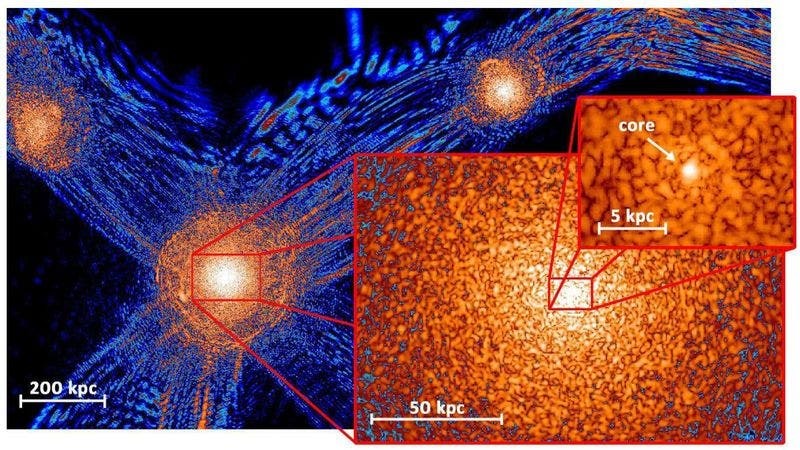 As the Ikerbasque researcher explained, "guided by the initial simulations of the formation of galaxies in this context, we have reinterpreted cold dark matter as a Bose-Einstein condensate". So, "the ultra-light bosons forming the condensate share the same quantum wave function, so disturbance patterns are formed on astronomic scales in the form of large-scale waves". The image above is a comparison of the radial density profiles of the galaxies which the researchers have created by displaying the soliton in the centre of each galaxy with a halo surrounding it. The solitons are broader but have less mass in the smaller galaxies. 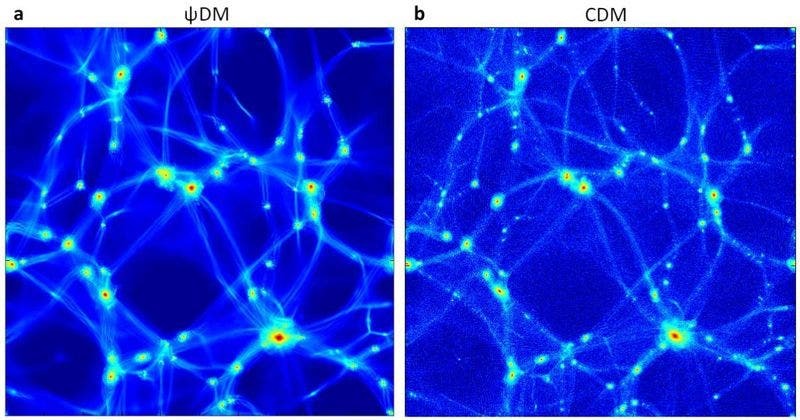 The image left, below, shows that a comparison of the distribution of matter is very similar on a large scale between wave dark matter, the focus of this research, and the usual dark matter particle. Image right shows that in galaxies the structure is very different in the interpretation of the wave, which has been carried out in this research; the research predicts the soliton of dark matter in the centre surrounded by an extensive halo of dark matter in the form of large "spots", which are the slowly fluctuating density waves. 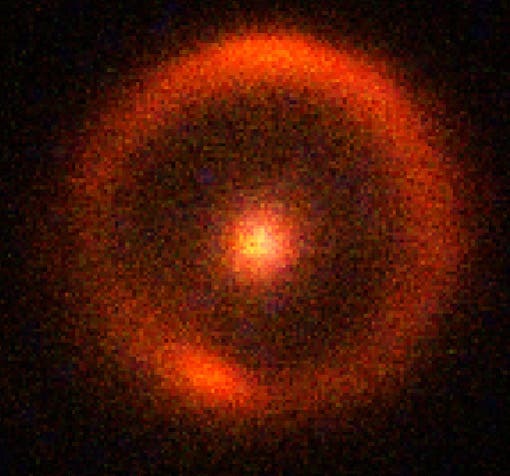 This leads to many predictions and solves the problem of puzzling cores in smaller galaxies. This is not Thomas Broadhurst's first publication in the prestigious journal Nature. In 2012, he participated in a piece of research on a galaxy of the epoch of the reionization, a stage in the early universe not explored previously and which could be the oldest galaxy discovered. This research opened up fresh possibilities to conduct research into the first galaxies to emerge after the Big Bang. Tom Broadhurst has a PhD in Physics from the University of Durham (United Kingdom). In 2010, he was recruited by Ikerbasque and carries out his work in the UPV/EHU's department of Theoretical Physics. His line of research focuses on observational cosmology, dark matter and the formation of galaxies. In a discovery announced Jan. 18, 2012 a team of researchers including an MIT postdoc has found a dark dwarf galaxy about 10 billion light years from Earth. It is only the second such galaxy ever observed outside our local region of the universe, and is by far the most distant. The dwarf galaxy is a satellite, meaning it clings to the edges of a larger galaxy. “For several reasons, it didn’t manage to form many or any stars, and therefore it stayed dark,” says Simona Vegetti, a Pappalardo Fellow in MIT’s Department of Physics.